The first edition of Rhumbles, the first boxing and entertainment concert in Lagos put together by ACI Entertainment held amidst pomp and pageantry on Thursday May 25 in Lagos. The event which was part of the lineup of activities to celebrate Lagos at 50 had eminent personalities in attendance. Among the top dignitaries present at the event were the Governor of Lagos, His Excellency, Mr. Akinwnumi Ambode; Prof. Wole Soyinka, the speaker of Lagos House Assemble, Hon. Mudashiru Obasa, state commissioners, state and federal legislators, party chieftains, sports & entertainment personalities, among many others. Hosted by top media personality, Olisa Adibua, the event featured two exhibition matches between two females and males amateur boxers. There were also musical performances from ACI Records acts, Buckwylla and Evelle who performed a beautiful rendition of her classic song, Eko Ile dedicated to Lagos at 50. The star music act of the night was Afrobeat legend, Femi Kuti who kept the guests entertained throughout his stay on the stage. Legendary DJ Jimmy Jatt was also on the wheel of steel. 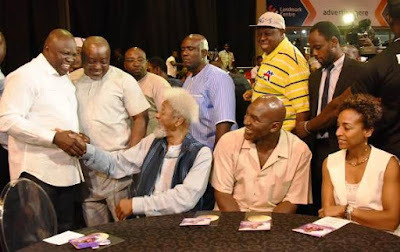 In a keynote address, Lagos State Governor, Akinwunmi Ambode, commended the initiator of the event, Mr. Wole Adeniyi of ACI Entertainment for inviting Holyfield, who he described as the only living boxing legend to be part of the Lagos at 50 celebrations. 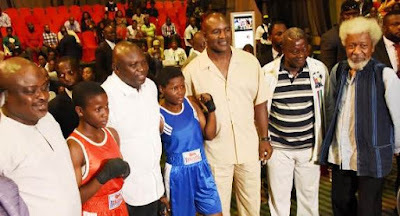 Ambode also thanked Holyfield for donating sporting equipment worth $3 million to the state. In between his speech, an official statement of apology was delivered by the governor who notified the audience that Tinubu would be unavailable for the charity bout as he had to attend very urgent national issues but he will stand for him. He then went on to present gifts to Evander Holyfield who had joined him on stage. Standing between Ambode and Holyfield, the referee of the charity bout, Prof. Wole Soyinka however decided to broker peace between because Holyield and Tinubu but not without jokingly disqualifying the two contestants. He disqualified Tinubu for being late and Holyfield for not undergoing a drug test before coming on stage. He however urged the audience to embrace the course of the event which is basically meant for Charity. Holyfield thanked ACI Entertainment and Lagos State Government for the reception given to him in Lagos. He also announced that his Real Deal Entertainment company has partnered with ACI Entertainment to discover future world champions in Nigeria via different initiatives including a boxing reality show which will all be focused on youth empowerment. “If you want to be a world champion, we will give you the baton”, he said. The CEO of the company, Mr. Wole Adeniyi said he believed it’s time to bring boxing entertainment back to Africa. “Boxing was one of the most popular leisure activities in Nigeria during the immediate post-WW11 era up until 1970's. Today, soccer matches are by far Nigeria's most popular sporting events but boxing bouts was once as popular, if not more so at the end of colonialism rule in Nigeria. Back then, many of our sporting stars were championship-caliber boxers. Given that historical boxing background, ACI Entertainment feels is only fitting and appropriate to start the process by bringing the five times heavy weight champion, Evander Holyfield on board as a partner”. The organisers have earlier announced that the charity-focused event “is aimed at bringing world attention to some health-related issues in Africa and will also be donating medical and relief materials worth millions of naira to Lagos State Government and other states.